A few of my friends and family have indicated they would like to meet up with me on the trail during my Pacific Crest Trail hike this year. So, you will need to know what is what and about what time I expect to be where (rough estimate). Today I was out buying my initial food and packages for my first resupply which I have to mail before I leave Venice. Right now my apartment here in Venice beach looks something like I imagine what the back room of REI looks like. I have clothes and tents and bags and boxes everywhere mixed in with skateboards and bikes and hammocks and hiking poles and stuff sacks and now even food. I purchased a LOT of food which is currently being delivered from quite literally all over the United States to my parents house in Oregon. I am going to have them send out the resupply packages for California that I will need. And they will also be mailing out my bounce bucket for me. The idea is that I will have all my paper maps in my bucket and will keep mailing it ahead of myself in order to always have all my maps. Main meal purchases today for first part of the trip (initial ‘supply’ I leave the southern monument with.) and my first resupply at Warner Springs. Tuesday April 8th, I mail out my Warner Spring 4 day Resupply. Friday April 11th, my last day of work and my going away party. April 12th, I expect an epic day of soup and watching tv and recovery from my party. April 13th toss my furniture, give it away etc. Have everything ready by this point. This will be my last ‘real’ night in Venice, I intend to come out and have a couple beers with people but I need to be up bright and early. April 15th-April 20th I will be Oregon putting together my resupply and hanging with my parents and setting up the schedule. They will be sending out my resupply. I also need to mail my Big Bear 5 day resupply before the 19th. April 23rd, drop off my Rental SUV and hang out in San Diego in my hiker clothes and have a nice sleep in a very nice Hotel bed and get room service. April 24th, very early I will be on a bus from El Cajon to Campo, I should arrive in Campo and set out about 10am. So, lets look at roughly where I will be when I am on the trail. 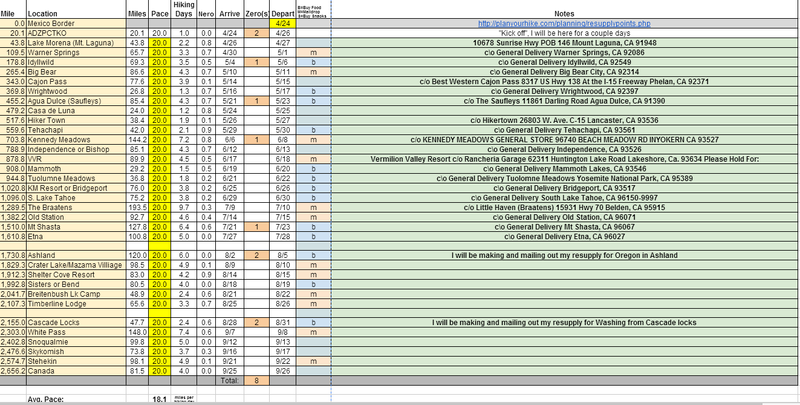 Here is my current “optimistic” spreadsheet schedule. And here is an image of it as well. If you would like to meet up with me, first check the PCTA map and guidebook section and also note that I am on somewhat of a tight schedule, as it is a race to get to the end before the snows, so it would be better to not do huge sections. One part that would be good would be the Mammoth -> Tuolumne Meadows section which is just under 40 miles, it is a great spot on the trail and there is an airport in Mammoth and you can get an easy bus from Tuolumne Meadows (it is the high point of Yosemite). The VVR->Mammoth would be another good option as VVR has shuttles and Mammoth has lots of transportation options. In Northern California I truncated a lot of the places from the resupply points list. Which I will be going through a town here and there every couple days in that section and buying food as I go. I will be ‘around’ Lake Tahoe for 4th of July, which would be pretty awesome. I plan some time off in Ashland Oregon as I used to live there and want to hang out for a bit. Also, I intend to stop for a bit in Cascade Locks, and definitely will be hanging out in Leavenworth WA as I have been there before also. I intend a zero (day when you don’t hike) in Stehekin WA and also hopefully Leavenworth. I would not suggest meeting me in the Oregon sections as I will be powering through Oregon, that is the flattest/fastest section of trail and I will more than likely be trying to make up time lost in Northern California. Additionally Washington in September could be really dicey depending on the weather (I read a blog by a hiker who referred to is as a ‘washing machine’) and if I am running late (I imagine I will be) I may not want to slow down as at this point I will be a walking machine in incredible shape and able to do some serious miles. However, the ‘Goat rocks wilderness’ is supposed to be one the prettiest sections of the trail. So, the ‘best’ areas to meet me would be around Mammoth lakes and Yosemite (I won’t mind hanging out there and chilling out, I am bringing a fishing pole during this whole section). And then Northern California around Lake Tahoe is a good area as well as you can get on and off the trail easily, though I would research it because there is some large sections there which go through lava flows so there is sharp and loose rocks everywhere. If you are really nuts, you can intercept the JMT at some of the lakes after the Whitney summit (not going to miss that) and we can hang and chill, though that is a pretty major time investment on your part. This entry was posted in pct, planning, resupply on March 22, 2014 by joeldg. 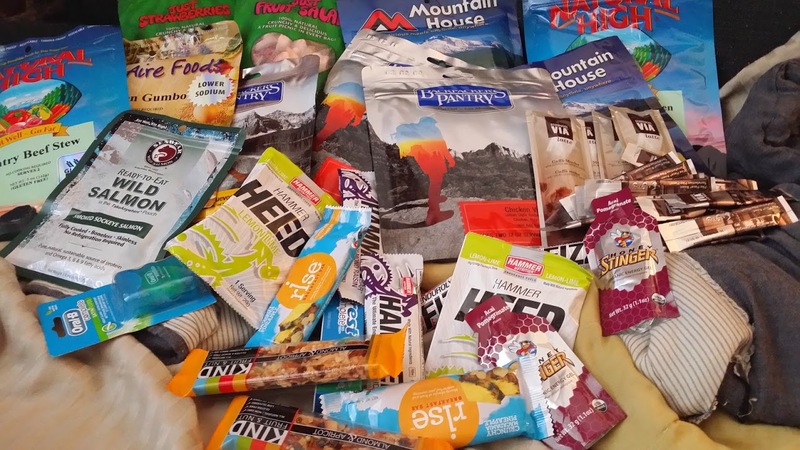 Food for the Pacific Crest Trail is a major thing, major. I have not personally experienced it but hiker-hunger is supposed to turn you into a food gobbling machine who can only think about ice cream and hamburgers. Apparently I can look forward to a lot of daydreaming about food so, I decided to take food, and my resupply, pretty seriously. Some hikers mail themselves all their food and get a resupply at every stop, while some only resupply at towns. Either way has it’s advantages and disadvantages. If you mail all your food you might get sick of what you mailed and that is not fun. If you only resupply in towns you may get stuck eating whatever is left over at gas stations, or having to hitchhike many miles out of your way for resupply. I am choosing a hybrid method, I will be mailing to specific spots where there are not good grocery stores or known resupply, or where resupply is prohibitively expensive. Towns which have services I will be just spending money there and doing my resupply as a I go. This way I have figured out I will be sending a total of about eight resupply boxes from the start and will create and mail more from the trail as needed. My spoon. Chosen for length, so you can get to the bottom of peanut butter jars. In my resupplies I will be needing to put in shoes, I am going with the shoe that seems to be tried and true and everyone’s favorite, I also have been wearing a pair for a couple months now off and on and agree that the Brooks shoe, the Cascadia is awesome. I have purchased two pairs which I will be mailing myself every 500 miles of the trail. Resupply coffee. The coffee I chose is Starbucks Via, just add hot water. Two resupplies will be for later parts of the trail. One to Ashland Oregon and another to Cascade Locks Oregon, each one will be mostly for sending maps and in each of these towns I will be making and sending out my resupply ahead. Oregon resupply from Ashland and then ones for Washington from Cascade locks. The reasoning behind this is that a lot can happen between then and now and I would not want to be stuck with food I won’t be sending out. I will be purchasing and mailing to myself more shoes at the Ashland point as well, as if I am injured or taken out with illness then I don’t want to have a pile of new shoes reminding me. Notably the most important resupply for me will be the one I do at Kennedy Meadows. Kennedy Meadows is the entry point for the Sierra and where just about everyone mails their bear canister as some kind of canister is required going forward from this point for quite a while. K.M. is also where you start to need things like micro-spikes and/or an Ice axe. Personally, I see having sure footing as a better option than having an ice axe as an ice axe is for ‘self arrest’, or stopping yourself while sliding down snowy/icy inclines. Microspikes (link below) are for not sliding down in the first place. I will be mailing myself stuff in a five gallon plastic bucket to Kennedy Meadows, which will also be acting as what is referred to as a ‘Bounce box’, as what I will be doing is sort of ‘bouncing’ this bucket, via the USPS, ahead of myself with various stuff in it (Later it will be useful to mail away my bear canister and other items I decide I don’t need) . The reason for it being in a plastic bucket is because cardboard boxes are not rodent proof (a problem in some smaller post offices where PCT hikers send lots of food) and it will not break down like a box will after repeated mailings and taping open and shut. The Sierra is where mosquitoes rule, so I will need to bring a head-net for them, it is also where I should start packing some lightweight rain gear. Amazon sells the bucket and the top separately. So here is what this resupply will look like. All images are links to Amazon where I bought them. The BV500 Bear Canister will fit inside the bucket with room for other stuff along the side. Inside the canister will be some of the following (I will be supplementing with others I purchase up in Oregon). The mashed potatoes I picked three different ones, Loaded, Smoked bacon and four cheese. Additionally dried fruit and Parmesan cheese in each resupply for flavor and variety. I also found these energy gels in Rei and of all of them, these were the ones missing and the clerk said they are awesome and people like them, so I will toss in three for each box. The one thing here I am not getting on amazon is olive oil, I am going to have to try to find small bottles of olive oil as I go, or bounce it in my bounce box, in order to add calories to the food. It is hard to find olive oil in small bottles and it does not store well in plastic as the taste can get very bad. Obviously I will be getting other things like nuts (“trail mix” is not my thing so I need to be creative here) and whatnot. Basically, I am going to get all my flat-rate boxes, sort all this stuff listed here into each and then go and pick up some things at the grocery store to round them out, crackers, string cheese, peanut butter and so forth. This list is what I am able to round up online without visually seeing and feeling the weight of it all to know how big the packages are and if they will fit right. This is about as good as I can do without being in a store. Still so much to do and I really only have a few weeks to get this all wrapped up. This entry was posted in pct, planning, resupply on March 16, 2014 by joeldg.